Car Part Pro puts your parts in front of professional repairers, body shops, and insurance appraisers. These professionals will use the Car Part Pro search to narrow their results by price, grade, location, and (most importantly!) delivery time. Right now, the biggest obstacle keeping these professionals from purchasing recycled parts is the lack of reliable delivery estimates. With Car Part Pro, we use the information you give us about the way your business runs to produce this information and incorporate it into the search, building trust with the searchers. When they purchase a part with Car Part Pro, they know when the part will arrive at the body shop and what condition it will be in, so there are no unpleasant surprises. This trust leads to more sales for you, the auto recycler, from these high-volume buyers. When you sign up for Car Part Pro, you will have a one-on-one conversation with a Car-Part.com technical support rep. We will learn how your business operates, how soon you get parts out the door, what kind of warranties you offer, your business hours, and where and when you deliver parts. We will use this information to configure your business correctly for the Car Part Pro search - and once it's done, your inventory will automatically start appearing in Car Part Pro searches along with all the accurate information these professionals need to make a purchasing decision. And once you're configured for Car Part Pro, you don't need to do anything else unless some of your business information changes down the road. If that happens, it's no problem! Just contact your support rep and your information will be changed. Boost your warranty sales! When people search for a part using the Car Part Pro search, they can search by desired warranty. Even if you don't offer warranties now, Car Part Pro can help you start by making it easy and simple. All you have to do is offer a warranty, and the search does the rest. Car Part Pro will effectively up-sell warranties for you whenever your part has a warranty that is equal to or greater than the warranty they are searching for. 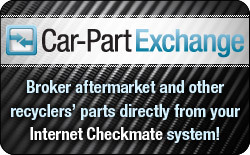 Car Part Pro even supports parts brokering! You can broker parts from other recyclers and have those parts appear in your inventory. Not only that, but Car Part Pro will take the other recycler's business practices and production times into account to provide your customers with accurate delivery information in the Car Part Pro search. It's all completely automatic, allowing you to easily offer your customers more parts and accurate information they can count on. When a customer has found your part and decided to purchase it, it's so convenient for them to click the Order Part button right from the search results! With the Order Part button, your customers can instantly place an order with you. 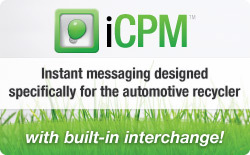 When a part is ordered, you will receive notifications through iCPM and email. Your online orders are also sent to our new Seller Order Manager program, where you can keep track of sold parts, edit or cancel orders, and find customer contact information. iCPM users have access to another valuable feature with the Verify tab. For Car Part Pro search users, the search results feature a Confirm Availability button next to the parts of participating recyclers. Because a part may be sold or otherwise changed after your inventory is uploaded, our Confirm Availability button allows your customers to instantly confirm that the information they see about availability and condition is still accurate, without actually ordering the part. The Verify tab in iCPM will show an immediate notification every time someone uses this button on one of your parts. It will include details such as the part information, user type, contact information, price breakdown, and the message they received from the service. As you can see, each notification contains valuable sales leads! To sell your parts to these high-volume buyers with Car Part Pro, you must be a Car-Part Gold subscriber. For more information about Car Part Pro, Car-Part Gold, or any of our other products, contact your sales rep!